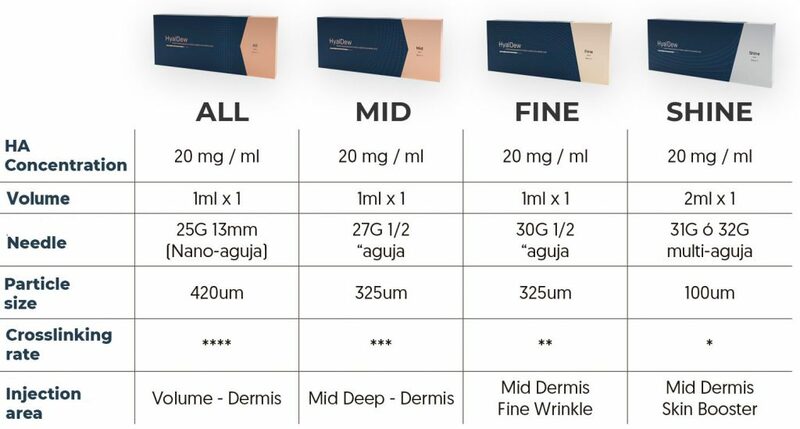 A 100% Hyaluronic Acid filler with a reduced crosslinking rate, lower viscosity and smaller particle size. 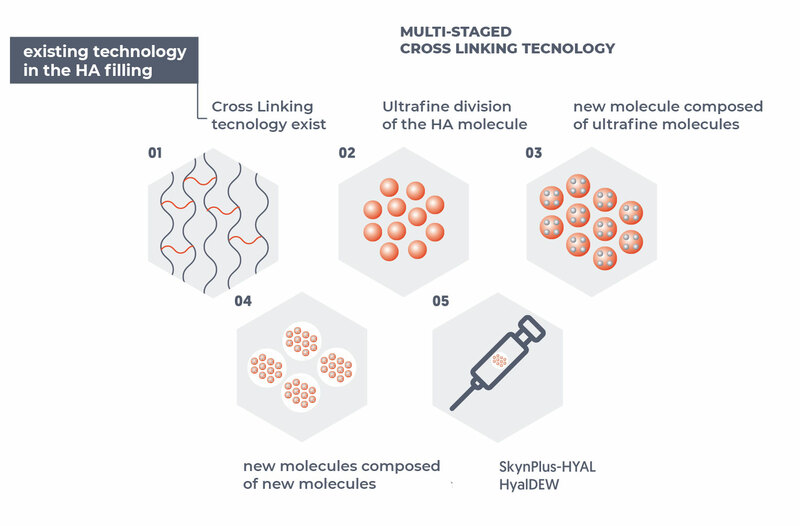 Overcoming the limitations of collagen crosslinking technology applied in conventional HA fillers, we have developed the patented manufacture of micro pearls using a Multi-Staged Cross-Linking (MCL) technology in three stages in order to create a more stable molecular structure and a higher rate of crosslinking. This solves the problem of the short duration of conventional HA fillers. HyalDew. Through the use of Biomacromolecules, we have increased the biocompatibility and biological safety to increase the volume, the antibiosis, the anti-inflammatory effect and the anti-adhesion between human tissues. We have achieved the manufacture of HA in a solid state that allows to create laminar forms of anti-adhesives and the creation of stem cell devices for tissue regeneration in solid state using biomacromolecules that are biocompatible and biologically safe. 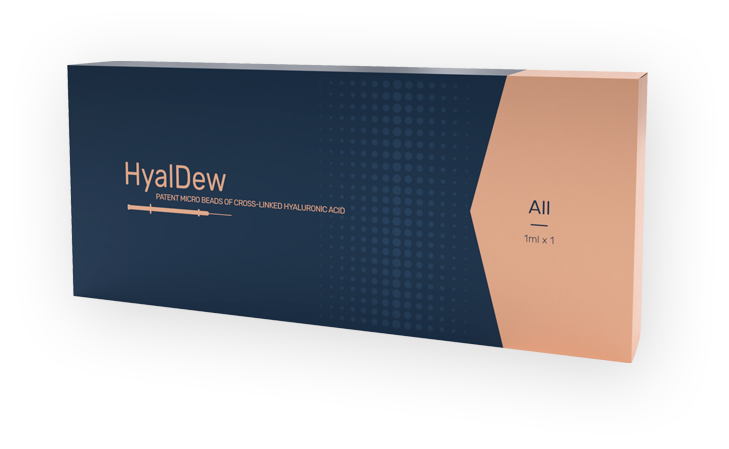 HyalDew is a popular product with a reduced crosslinking rate and lower viscosity and particle size. Apply our technology to achieve excellent longevity and safety. 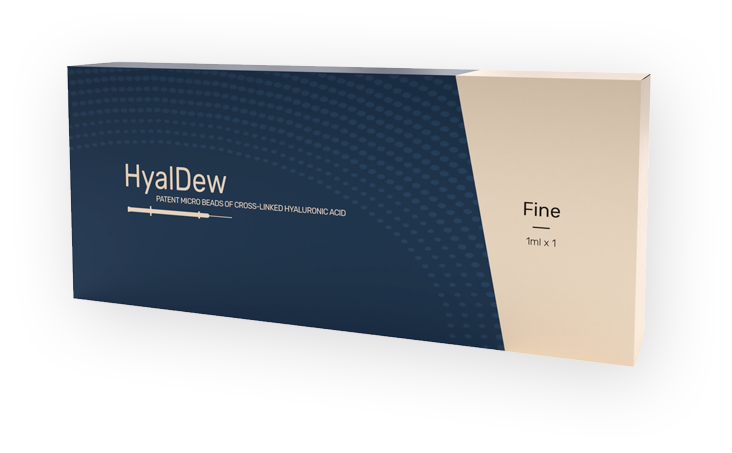 HyalDew All has a small particle size (420 um) that shows a good moldability that can be used in any area. It is a new and advanced product that is used to profile and give volume to the forehead, temples, nose, cheeks and chin, and improves deep expression lines, such as nasolabial folds. 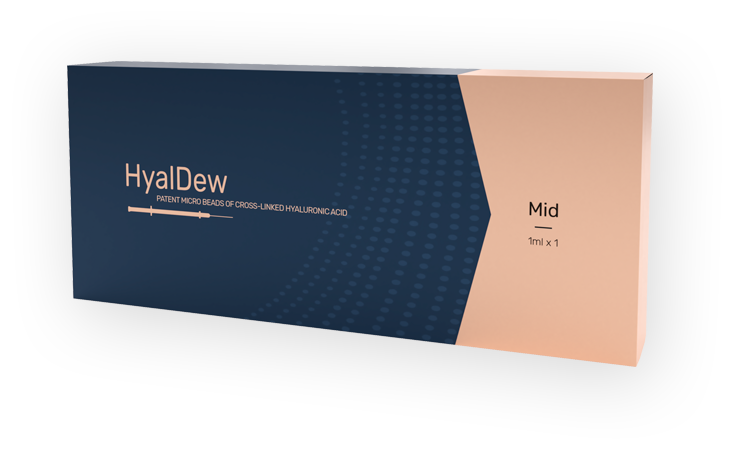 It is the versatile range of Hyaldew, which allows us to treat in a very broad way all areas, from a nasogenian groove to a lip profile. HyalDew Fine has a viscosity and a smaller particle size than HyalDew All, and is effective for fine wrinkles. 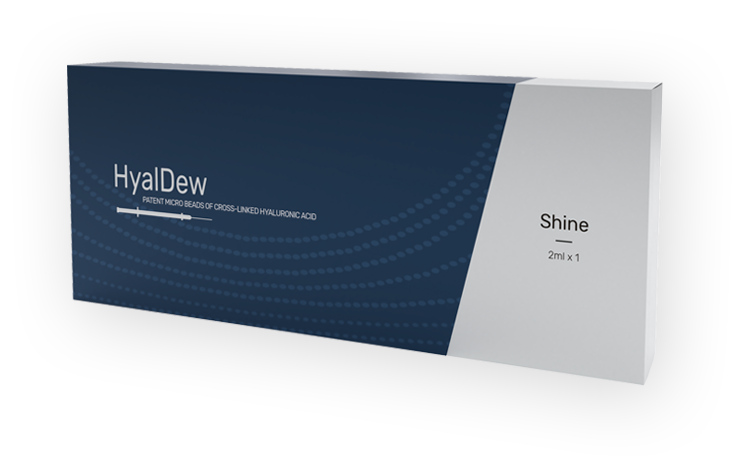 HyalDew Shine applies the technology of manufacture of microspheres of HA achieving a high hydrophilic capacity, durability and greater absorption of fabrics (the conventional products of gloss of water last from 5 to 10 days, while our product lasts more than 1-2 months) . Conventional filler companies that claim to have created a long-lasting HA filler tell us that they have managed to increase the cross-linking rate. However, most products have only increased the concentration and size of the particles due to the limitations of Cross-Linking technology. This does not contribute to the longevity of the product. In addition, products that simply increase the concentration result in a product that is not easily moldable. Our product applies the patented technology of microbead processing in 3 stages that allows to increase the viscosity and produce a long lasting filling. By controlling the speed of crosslinking to adjust the viscosity, we can produce a wide range of high quality fillings depending on their use.